Science • They've narrowed search for mysterious sources of the most energetic particles in universe. 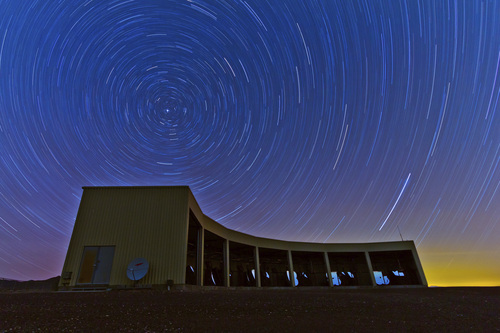 Ben Stokes | University of Utah In this time-lapse photo, stars appear to rotate above the Middle Drum facility of the Telescope Array, a $25 million cosmic ray observatory that sprawls across the desert west of Delta, Utah. Physicists from the University of Utah, University of Tokyo and elsewhere report the observatory has detected a ìhotspotî in the northern sky emitting a disproportionate number of ultrahigh-energy cosmic rays, which are the most energetic particles in the universe. The discovery of a hotspot is a step in the long quest to discover the source or sources of the most powerful cosmic rays. 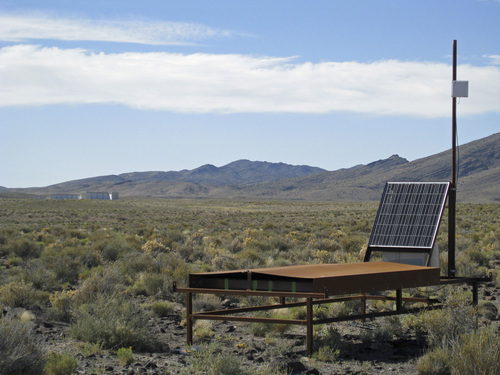 John Matthews | University of Utah This solar-powered, table-like scintillation detector at the Telescope Array cosmic ray observatory measures the strength and direction of "air shower" particles that fall to Earth after incoming cosmic ray particles hit gas molecules in the atmosphere. In a major experiment, 507 of the observatory's 523 scintillation detectors – spread out over 300 square miles of Utah desert – were used to find a "hotspot" in the northern sky that is emitting a greater-than-expected number of ultrahigh-energy cosmic rays. Such cosmic rays are the most energetic particles in the universe, and physicists are trying to determine their source or sources. 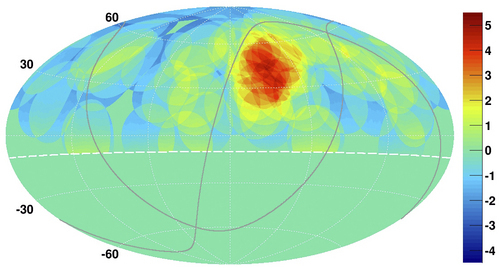 K. Kawata | University of Tokyo Institute for Cosmic Ray Research This map of the northern sky shows cosmic ray concentrations, with a ìhotspotî with a disproportionate number of cosmic rays shown as the bright red and yellow spot, upper right. An international team of physicists using the University of Utah-operated Telescope Array near Delta, Utah, say their discovery of the hotspot should narrow the search for the mysterious source or sources of ultrahigh-energy cosmic rays, which carry more energy than any other known particle in the universe. Lee J. Siegel | University of Utah University of Utah physicists Gordon Thomson, Charlie Jui and John Matthews discuss the Telescope Array cosmic ray observatory's discovery of a "hotspot" – located beneath the Big Dipper in the northern sky – emitting an unusual number of ultrahigh-energy cosmic rays. The source of these rays, which are the most energetic particles in the universe, remains unknown, but the new finding will help narrow the search. Scientists at the University of Utah have taken an important step toward understanding where ultrahigh-energy cosmic rays come from and how they become so charged. The U.&apos;s $25 million Telescope Array in the desert near Delta points to a "hot spot" just below the Big Dipper as the possible mysterious source of the rays, which are the highest-energy particles in the universe. "We can&apos;t say we&apos;ve found the answer, but believe me, this is a major step on the way," said Gordon Thomson, professor of physics and astronomy at the U. "All we see is a blob in the sky, and inside this blob there is all sorts of stuff  various types of objects  that could be the source. … Now we know where to look." Mapping the origin of the rays has proven difficult because magnetic fields in our Milky Way galaxy and beyond distort their direction. However, researchers used a high cutoff to look at only the highest-energy rays, because particles at that level and higher bent the least in magnetic fields and could be better traced. The "hot spot" was identified after 125 researchers from the U.S., Japan, South Korea, Russia and Belgium analyzed data from May 2008 to May 2013. During that time frame, 72 ultrahigh-energy rays above the cutoff hit the telescope array. Of those, 19 came from the same area, when only 4.5 should have come from that area if the rays had originated in all parts of the sky, said Charlie Jui (pronounced ray), U. professor of physics and astronomy. 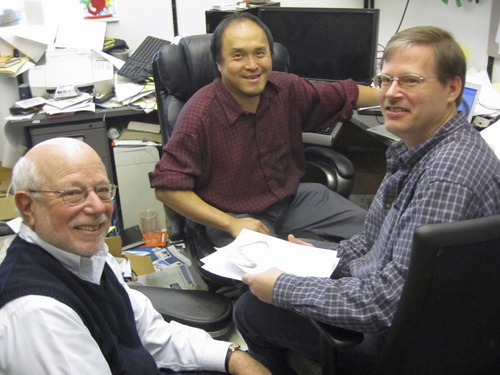 Their study is being published in Astrophysical Journal Letters. Many theorists currently believe the rays come from supermassive black holes found at the center of many galaxies, Thomson said. "They produce very powerful gravitational fields," Thomson said, "and if a star wanders too close, tidal forces break the star into smithereens, and magnetic fields can accelerate them out in a jet at very high energies" in a stream called a blazar. Others believe they could be produced by exploding stars, known as supernovas. "Nobody knows for sure if that&apos;s where they originate," Thomson said. On Earth, the European Organization for Nuclear Research (CERN) particle accelerator in Europe has been able to energize particles, but only to a level several magnitudes lower than what is found in nature, he said. An ultrahigh-energy particle is at least 1 billion billion electron volts. The U. scientists were looking at rays of at least 57 billion billion electron volts. Getting hit on the head with an ultrahigh-energy particle would feel like a fastball to the skull, but they don&apos;t directly penetrate Earth&apos;s atmosphere. Instead, they hit the atmosphere and create a collision cascade effect with gases in the atmosphere. Those showers of gases are then collected by the 523 table-like scintillation detectors that are spread across 300 square miles at the U.&apos;s Telescope Array. Scientists would like to increase their space to be able to collect more data. The land they would like to move into is owned by the Bureau of Land Management and the Utah School and Institutional Trust Lands Administration, according to John Matthews, U. research professor of physics and astronomy. Researchers hope to obtain $6.4 million needed for the expansion from U.S. and Japanese governments later this year, and then finish the expansion in 2016, Jui said. More data would allow researchers to better pinpoint the exact source of the rays. "It tells us there is at least a good chance these are coming from matter we can see as opposed to a different class of mechanisms where you are producing these particles with exotic processes" such as cosmic strings, Jui said. "It points us to the next logical step in the search: building a larger detector that collects four times as many [ultrahigh-energy cosmic ray] events per year. With more events, we are more likely to see structure in that hot spot blob and that may point us toward the real sources."